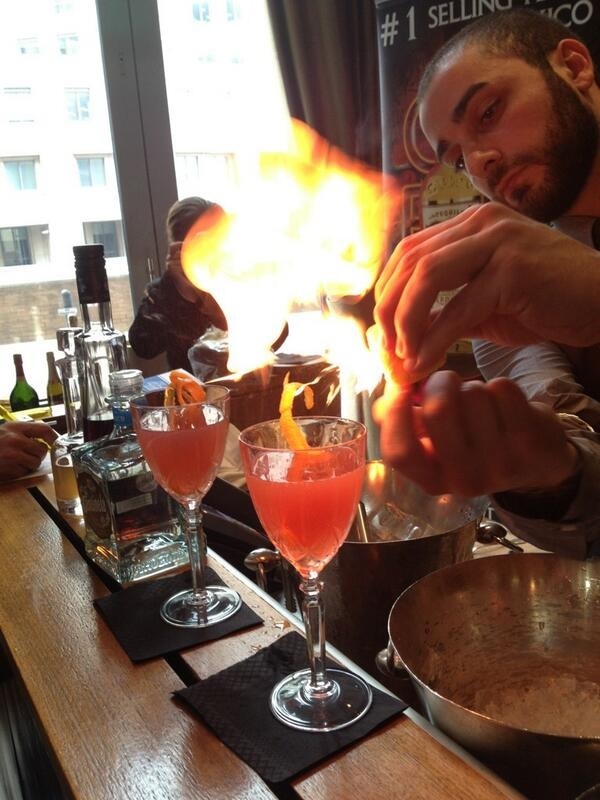 Thursday 4th July saw the Canary Wharf heat of the Centinela Cocktail competition that will soon be coming to its peak with our finals! Bartenders across the nation have been sending in their recipes and battling it out to be one of the lucky 3 regional winners and travel to Arrandas in Mexico to see the distillery! But they have some work to do to get there. All the heats have seen top quality cocktails, and the Four Seasons Hotel on Canary Wharf was certainly no exception. 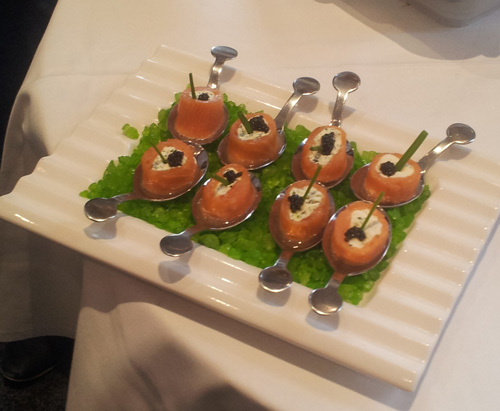 As we were assembling at a lovely side bar in the stunning hotel, we were welcomed with delicious smoked salmon appetisers and a fruity Bellini, and their hospitality didn’t end there. I will take this moment to thank the team for continuing to bring out mouth-watering appetisers throughout the competition and making sure the judges had lined their stomachs before tasting the cocktails. This heat had five participants, representing the Four Seasons, Parlour Bar, Rocket, Roka and The Pearson Room. First up was Xiandy from the Four Seasons who was kindly stepping in to make her colleague Jolita’s cocktail as sadly she was ill on the day. Jumping straight in, Xiandy measured out the tequila and a lime mixture and gave it a good shake. After pouring this into martini glasses she delicately poured grenadine and curacao blue into the glasses so they layered up on the bottom… making the Union Juan cocktail! Next up was Radoslaf from the Parlour Bar making a Mexican Punch.. and punchy this number was! Muddling two jalopeno peppers, avocado, and a Mexican drink called Tamarind. Adding some lime juice for liquid he shook it up and served it rocks glasses with a garnish that showed all the flavours. And there was certainly a lovely kick to the drink! Third was Paolo from Roka’s Okinawa Sunshine – a delicious medley of ginger, agave syrup, saki wine, and of course the Centinela tequila. Added on top was a unique topping with mustard seeds. 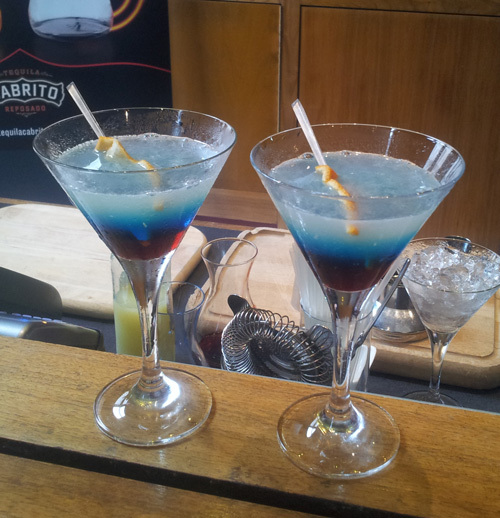 Presented in martini glasses, it oozed with style and tasted sublime! 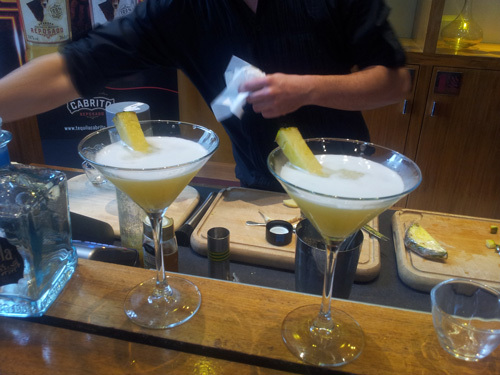 Next was Simone from Rocket who carried on the theme of yellow sunshine with his cocktail, Simone’s Summery. Based on combining the Centinela tequila with delicious fresh pineapple and bitters he transformed the clear tequila into a great cocktail, with amazing aromas coming from the pineapple leaf garnish. Last up was Mario from the Pearson Room. Adding to the delicious Centinela, he combined the flavours of Cartron Framboise de Bourgogne and a jasmine tea homemade creation. After a firm shake he strained the liquid into sherry glasses with lovely orange peel garnishes inside. But he didn’t finish there… Mario added fire to the mix by a very skilful lighting of orange peel to bring out more citrus flavours into the drink! The result, a Jasmine Room. With such a varied array of cocktails and so many techniques used to express the tequila, it was a tough feat for us judges to compare and contrast. All the cocktails were simply delicious and I could certainly see them all being popular if served up in a bar… but alas, a winner there must be. It gave us great pleasure to announce, the winner of the Four Season’s Canary Wharf heat was the lovely Mario from the Pearson Room! Congratulations Mario and we look forward to seeing your pyrotechnics in the London final!